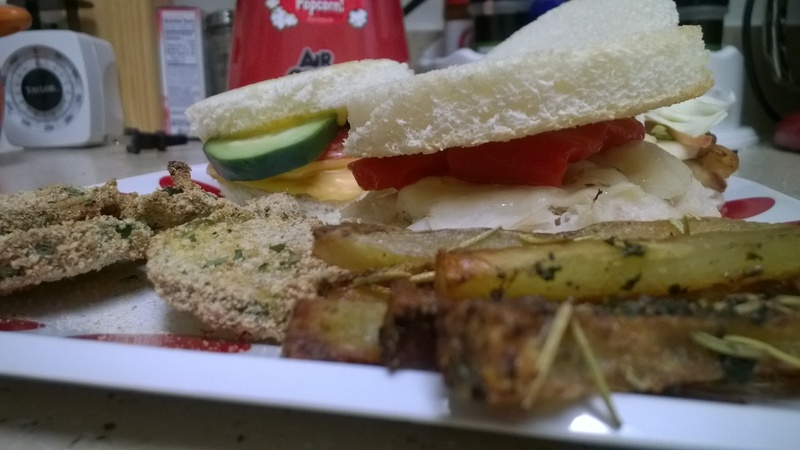 This week’s Moon Madness meal is dedicated to Ami Mizuno aka Sailor Mercury. Ami’s always been the practical scout, so it’s no wonder that her favorite food is equally as practical–the sandwich. It’s portable and delectable with a thousand different interchangeable breads, meats, cheeses, and sauces, the perfect meal for someone who likes both order and variety. In the Sailor Moon episode titled “Food Fetish,” Ami can be seen eating not one, but two sandwiches while typing away at Quicksilver-like speed on her keyboard (always hard at work, that Ami, even on her lunch break). So here’s to Amy, the sandwich queen of the universe (and fellow Virgo 🙂 )! I chose to make three different sandwich combinations, but feel free to mix and match ingredients or to add ingredients of your own! * I used a large biscuit cutter to make the bread circular. DON’T throw away excess bread. Use it to make croutons or bread crumbs. 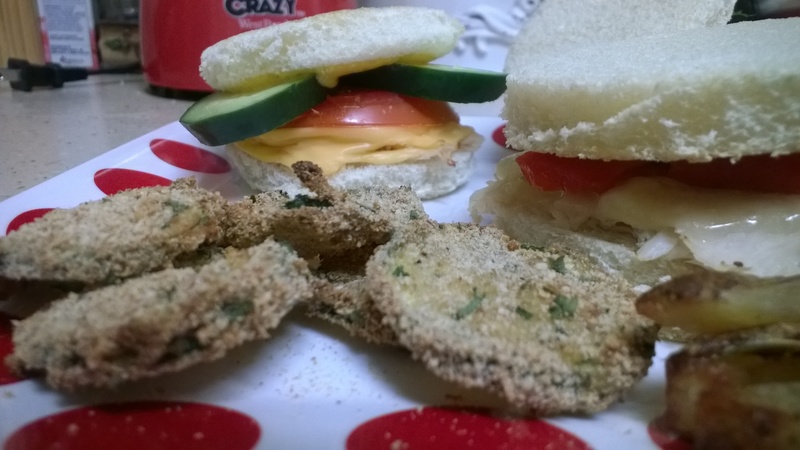 Sandwiches beg for crunchy sides. Zucchini chips and Truffle Fries add just the right texture. Preheat oven to 425 degrees. Line a baking sheet with parchment paper and place cooking rack on top of baking sheet. Cut zucchini into thin slices, about the width of two knife blades. Combine eggs, 1/2 tsp sea salt, and 1/4 tsp black pepper in a small bowl. Combine bread crumbs, 1/2 tsp sea salt, 1/4 tsp pepper, and 1/2 tsp of parsley in a medium-sized bowl. Dip and coat zucchini slices into egg mixture. Dip coated zucchini slices into bread crumb mixture. Place slices onto cooking rack. Bake for 15 minutes, flip, and bake for 15 additional minutes or until zucchini chips are golden brown and crunchy. Clean potatoes and cut into 1/4 inch strips. Place potatoes into a medium-sized mixing bowl. Coat with all other ingredients and mix well. Bake for 15-17 minutes on either side or until crispy and cooked throughout.